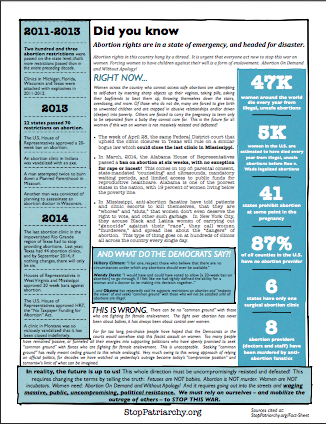 In March and April of 2014, Stop Patriarchy went out into the world with a powerful Fact Sheet (right), calling on people from many walks of life to stand up to change the terms of the debate and fight unapologetically against the unprecedented attacks on abortion rights and access. On April 11, people came together in several cities to sound the alarm on the abortion rights emergency, bringing alive the stories of women and their abortions - both before Roe v. Wade and after - and the stories of the providers that risk their lives every day to provide women with this essential choice. On April 12, we carried "the verdict" from the speak outs out into the world: protests were held outside institutions that are spearheading the attacks on abortion. People stood for an hour in silent protest, holding up bloody coat hangers and chains to indict these institutions and point to the world they are working for - one where women are driven to risk their lives to self induce abortions or forced into motherhood against their will. Others held pictures of the faces of women who have died from illegal abortion. At the end of an hour, participants read out loud a Pledge to Defend Abortion Rights and Defeat the War on Women. Video of both speak outs and photos of these actions are below.